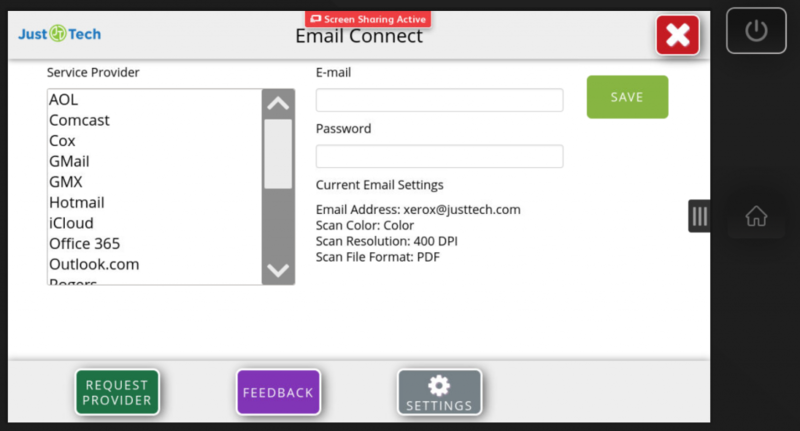 JustTech, a leading provider of customized application services for Xerox ConnectKey, AltaLink & VersaLink multifunction printers is proud to announce the relaunch of the Email Connect App. 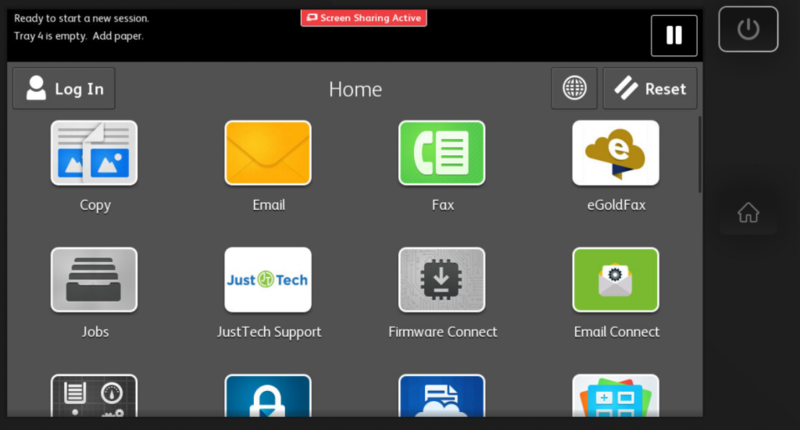 JustTech currently has more than 30,000 apps installed on Xerox devices around the globe and that number will surely grow with new installs of the Email Connect App. With the Email Connect App, scan to email settings are instantly configured on the Xerox multifunction printer by entering a username, password and selecting the email provider from a pre-populated field. This simple and easy to use process will greatly benefit customers when needing to setup scan to email or to change their email’s password that is associated with the account. Scan to Email has proven to be the #1 way that users scan from multifunction printers. The scan to email feature does not only need to be configured upon the new install of the multifunction printer. Should an email carrier’s settings change, scan to email needs to be reconfigured. Should an email address change that is being used for scan to email, then scan to email needs to be reconfigured. Should a password change, scan to email needs to be reconfigured. Many organizations reset email passwords every 30, 60 or 90 days due to security concerns. Outside of a technical service or supply issue, an incident involving scan to email is the most prevalent issue that most help desks receive. Currently to customize scan to email settings, users must navigate through several screens of the web interface of the device and enter in multiple pieces of data. Click here to see a visual comparison of the standard way to enter scan to email settings as compared to using the Email Connect App. The Email Connect App is now available in the Xerox App Gallery for a free download! 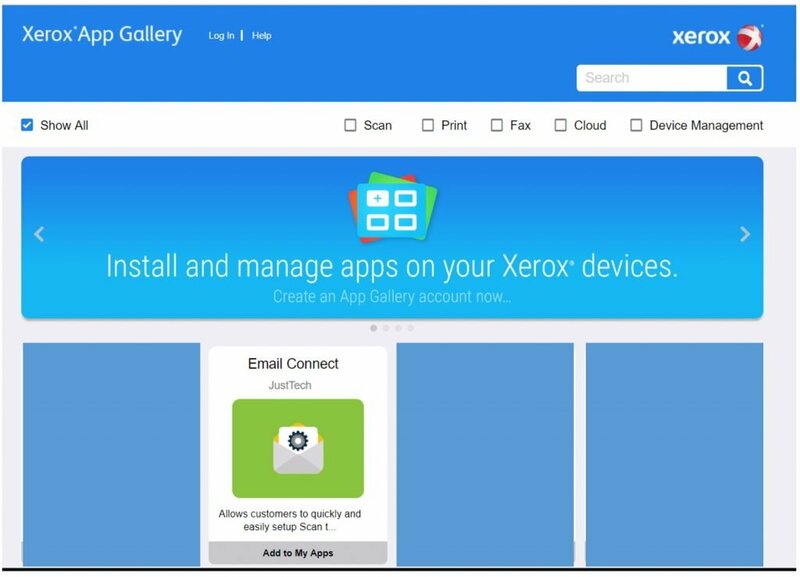 Users can select the App Gallery from the User Interface of their Xerox ConnectKey, AltaLink or VersaLink device and then select the Email Connect App. Enter in the username, password & select email provider and scan to email is configured and ready to use. In the app, users can request their email provider be added to the list if it is not currently available. Just·Tech is the first Xerox certified Personalized Application Builder Authorized Developer in the United States. With our App Solutions, we create custom apps for Xerox multifunction copiers that increase efficiency and improve workflows. There are more than 30,000 apps that we have created installed on Xerox devices across the globe.